The Tre Kronor series of knives is surely one of the finest ever coming from Fallkniven and the TK1im is no exception. This is a strong sturdy and very useful knife especially with its ivory Micarta handle which allows it to be as versatile and as useful as possible in any sort of situation. 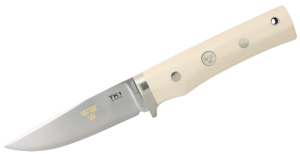 As with other knives in the Tre Kronor series, the TK1im offers what can be termed as a top class technological solution married with a design that is uniquely Swedish. The process for the development of the blade means that Fallkniven have come up with a laminated product and is also made out of a combination of steel that is also powdered. And to make the blade a near perfect item, Fallkniven also add a steel layer which is resistant to corrosion as well as being extremely tough and which really stabilizes the hard centre of the knife. This means that the blade is rigid and strong and retains the edge perfectly. The TK1im is one of those minimalist knives which means that form is in total harmony with function. So if you want to treat yourself to a knife that is both beautiful and highly advanced technically, the TK1im is really your choice since it really is an exceptional knife in every department. With a steel combination that offers unparalleled strength and an edge which has never previously been found on the world market, you can also rest assured that each and every knife is produced manually by knife makers which are hugely experienced and who have hundreds of years of tradition in their craftsmanship hands. With a full covering black leather sheath that is custom made for it, the TK1im is truly a knife to be reckoned with.